The largest maple in Canada, reaching heights of 36 metres. When it grows in the forest, it develops a narrow crown that is supported by a stem free of branches for half its length. Those growing in the open have a broad crown which is supported by a few large, spreading limbs. Leaves are deeply five-lobed and are the largest of any maple in Canada, measuring 15 to 30 centimetres across. They have only a few bluntish, wavy teeth; are shiny, dark green on top and paler underneath; and turn yellow in the fall. The leaf stalk sometimes oozes a milky substance when it is broken. Twigs and leaves emerge as pairs. Small greenish-yellow flowers, about 3 millimetres across, appear early in spring, hanging in clusters at the ends of twigs. The fruit consists of two winged seeds joined at the base. Seeds are hairy, 3 to 6 centimetres long. Greyish-brown, shallowly grooved when older. It is restricted to the southwest corner of British Columbia at low to mid elevations. Bigleaf maple generally grows on coarse, gravelly, moist soils, such as those found near river, lake, or stream edges, but it can occur on other moist soils such as seepage areas. It commonly occurs in mixed groups of trees with red alder, black cottonwood, Douglas-fir, western redcedar, and western hemlock. 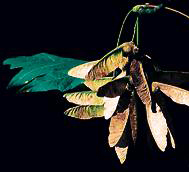 Squirrels, grosbeaks, and mice eat the seeds of bigleaf maples, and deer and elk eat the twigs. 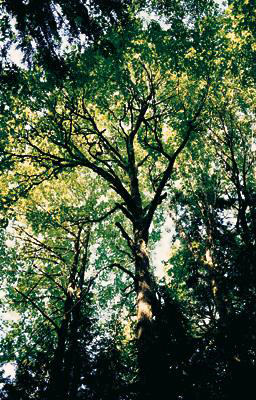 Coastal peoples used bigleaf maple wood to make dishes, pipes and hooks for clothing. Many groups who made paddles out of the wood called it the paddle tree. They used the inner bark to make baskets, rope and whisks for whipping soopolalie berries. In the Interior, aboriginal people ate the young shoots raw in the spring. They also made a type of maple syrup, but because the sap has a low sugar content, it takes a large quantity of sap to make a small amount of syrup. Because of its close grain and moderate hardness, maple wood is used commercially for furniture, interior finishing, and musical instruments. Maple flowers are quite sweet and edible and can be used in salads. 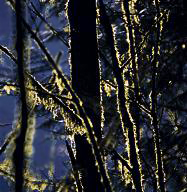 Bigleaf maple trees are often draped in mosses, because the bark is rich in calcium and moisture, adding to the attractive wet rainforest plant community.